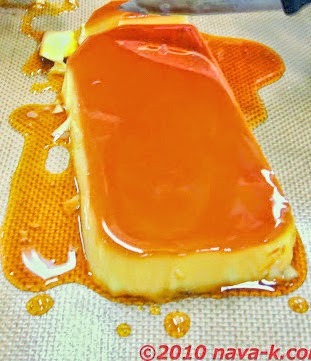 Creme Caramel (Custard Caramel) into our dessert food picture. Where did the recipe come from? My chef friend. He being quite a dessert food hero and me without doubting his recipe making creme caramel. Creme Caramel, aka Custard Caramel by the way is one of my favourites. Not for pigging out, but like a small piece or a portion into this velvety, wobbly and such a melting moment custard in amber sugar. Yum. Boil sugar and water (just enough) until it turns amber. (Note: too much water means more time in making the caramel and if the caramel becomes too dark in colour, it will taste bitter). Pour caramel into ramekins or mould(s). Tilt so that caramel covers the bottom and partway up to the side. Prepare custard by heating milk (just warm, not boiling) until bubbles appear at the edges of the pot. In another bowl, whisk eggs and sugar lightly until blended. Slowly pour hot milk over eggs (tempering) until sugar dissolves. Pour custard through a sieve and divide evenly into prepared moulds. Place in water bath (add water to your baking tray, the bottom baking tray please, not on the caramel mixture) and bake for 45 minutes. 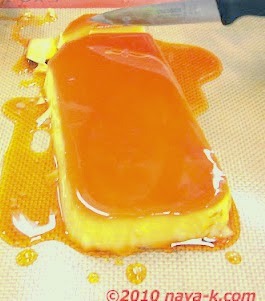 (Note: the key to a delicious creme caramel is baking it longer than 1/2 hour). Cool it down, slide a knife around the mould to glide caramel and serve. Oh, should be great, mind you, with a scoop of ice cream. This one of my favorite, perfectly done. Love the way you have explained it. this is one of popular dessert even in Sri Lanka,I use steamer for the final step.This looks delicious! Omg this looks amazing my type of desert almost like flan.